A new monument is showcasing TCU’s past. The plaque is dedicated to the Native American tribes who lived on TCU’s property and is located between Reed Hall and Jarvis Hall. A monument recognizing Native American and indigenous peoples will be dedicated Monday. Photo courtesy of the Native and Indigenous Student Association (NISA) Facebook page. The monument is made out of granite, which religion professor Dr. Scott Langston said was a choice made in conjunction with the tribes. The plaque also features the quote “this ancient land, for all our relations,” in both English and Wichita. The original plan was to have the entire quote in both languages, but when the last fluent speaker of Wichita died in 2016, that became impossible. 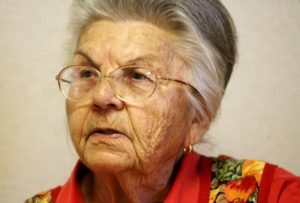 Doris McLemore, the last fluent speaker of the Wichita language, died on August 30, 2016. Photo courtesy of Tulsa World. Many students may walk right past the monument without noticing it, but for those whose heritage it represents, this recognition is momentous. While the monument is a great first step, Langston said he believes the university could do more to support the Native American community. Smith, a member of the Native and Indigenous Students Association (NISA), sees awareness as the biggest problem on campus. The monument dedication ceremony will take place at 10 a.m. Monday and will include a delegation from the Wichita and Affiliated Tribes. Provost Nowell Donovan will speak at the event and Chancellor Victor Boschini will send comments to be read in his absence. Nick is a senior journalism student from Cleveland, Ohio. He covers the TCU soccer team for TCU 360. Nick is an honors student and is minoring in music.